& till now I still remember how shocked of a face I had when the guy selling corns at Camerons showed that the corns can be eaten raw. hahah but it was good technique, made all of us each bought one on the spot-_-!! LOL. 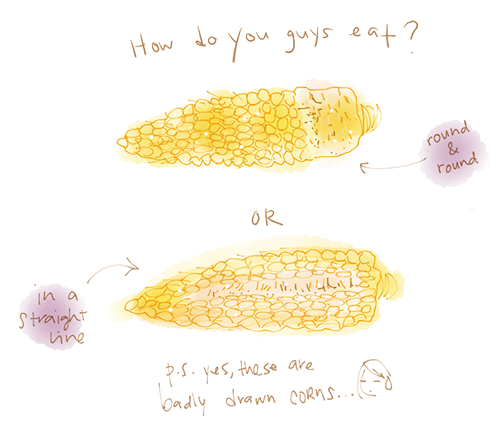 I've had this discussion with my colleagues when we had corn one day. xD I usually eat in a straight line. I'm a round and round kinda guy. Straight line!! And I nibble them off. wah! you have fresh corns at your yard! hahah i mau!